LAWRENCE – A patriot, as defined by the Merriam-Webster Dictionary, is “One who loves his or her country and supports its authority and interests.” The word is sometimes overused or even misused, but not when we use it to describe Natasha Young, make that Staff Sergeant Young, United States Marine Corps, who is this month’s Valley Patriot of the Month. Staff Sergeant Young is a Marine first and foremost, but also a Bulk Fuel Specialist currently serving as an Enlisted Accessions Recruiter in Plymouth, MA. Her 8 year career has taken her to Ft. Lee, Va., Okinawa, Japan, the Humvee Detachment in Londonderry, NH, New River, NC, Cherry Point, NC, Camp Lejeune, SC, Iraq, and now to The United States Marine Corps Recruiting Substation, Plymouth, MA. She always sets the pace in whatever position she holds and is doing many great things with her new position as an Enlisted Accessions Recruiter. She has been awarded a Navy Commendation Medal, 4 Navy and Marine Corps Medals, the Navy Unit Citation, 2 Meritorious Unit Service Medals, an Iraqi Campaign Medal, and Expeditionary and Service Medals in the Global War on Terror. When I asked her which awards and/or decorations are the most important to her she replied, “Do you want me to be completely honest?” and then continued, “I don’t wear them because they look nice, but the one that is the most important to me is my Navy Commendation Medal…” Staff Sergeant Young earned this award while she was deployed for a year in support of Operation Iraqi Freedom. While stationed at Camp Lejeune, Staff Sergeant Young was tasked with the 2nd EOD Company (Explosive Ordnance Disposal) and was attached to that Company for two years. 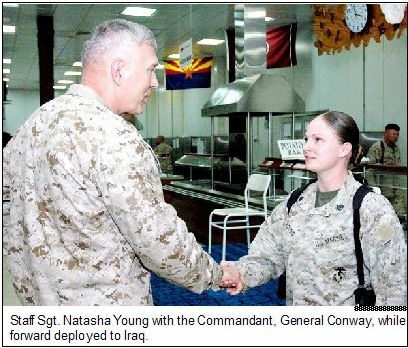 She was hand-picked by the Company Commander of the 2nd EOD Company to accompany them to Iraq due to her organizational skills and her attention to detail. She went on to say that some of the men and women she was deployed with from the 2nd EOD Company paid the ultimate price and did not return with her. When I first spoke to Staff Sergeant Young, I was really impressed with her professionalism and demeanor as she spoke of her service and commitment to the Marine Corps. Her enthusiasm and sincere appreciation for being a part of the Corps was ever present during our conversation. She loves the fact that the Marine Corps has taught her many things, but what she cherishes the most about her service in the Marine Corps is her fellow Marines and the friendships that she has developed over the years. Staff Sergeant Young is pursuing an Associates Degree in Liberal Arts at this time and, in the future, she would like to earn a Bachelor’s degree in Social Work/Youth Counseling. She has aspirations of setting up her own “Boot Camp” for youngsters in the future. Staff Sergeant Young has a very big soft spot for the youngsters generally, and for Lawrence youth in particular. She says, “If they can dream it, they can do it!” She attributes her strong-willed, can-do attitude to living and growing up in Lawrence. She is truly a Patriot and no doubt a top-notch, quality individual that exudes enthusiasm and is fervently proud to serve her country. She describes herself as “colorful” and “vibrant” and I would have to say that that is an apt description after speaking with her. You may see Staff Sergeant Natasha Young on her brand-new 2008 Harley Nightster somewhere on I-495. If you do, say, “Hi” and “Semper Fi”. Staff Sergeant Natasha Young, thank you for your dedicated service!